Ruger, looks like an LCP. Nope, here's a hint: It was sold in the U.S. but it is an import. Well and the thing that confused me too is that the CZ999 is also called a "Scorpion" but I know that CZ (the Czech company) also has their classic Skorpion/Scorpion machine pistol! Actually I can't remember if it's Ceska Zbrojovka that made (they don't make them anymore IIRC) the Skorpions originally but I saw, when getting my rifle, that they had them online in their collection. Vektor Arms CP 1 9mm, South African, it took me a while, I had to look for it, I had not seen one before. Which CZ rifle is yours? Mine's the 452 Scout. 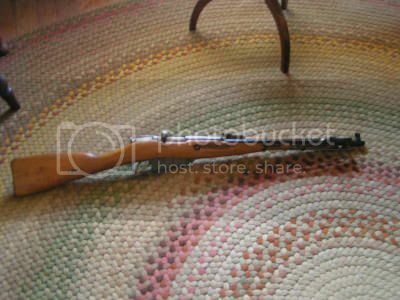 Mine is an older Rifle, It's on a what looks to be a 1950s Mauser K98 Receiver, on the ation it says "Ceskovenska' Zbrojovka A.S.,BRNO." It's still in 8MM and I used for a hunting Rifle years ago. Jackpot, glad it made you work a bit. And it is quite a distinctive pistol too. EDIT: Actually, what led me to post that pistol while researching that Zastava posted by Super Six, I noticed that it was also produced under license by a South African manufacturer Tressitu as a TZ99, and when I looked up the Tressitu TZ99 the Vector CP-1 popped up and it certainly looked interesting. Last edited by Blair Maynard; 20 Feb 14, 15:48. You are right, it´s Ceska Zbrojovka that makes Scorpion, both for army and hobby/ sport. Okay yeah thanks. Yeah they have the old Skorpion pistol/machine pistol and then the Scorpion EVO. The Scorpion EVO looks pretty nice aesthetically. Not sure how it shoots. Ah it looks nice. I'll have to look on mine and see if it says something similar. I think in the meantime (at least sometime before getting mine/my researching their products) they probably just shortened it to Ceska. Also, I think the BRNO part is the same but I want to also say that they have something like "Uhersky Brod" or the like. A quick search on google says that Brno is a big city in the Czech Republic so I assume that's where they're based. BRNO was the big Arsenal the Germans took over in WWII and had them make the K98s, the Germans called them Bruno's (the Rifles), they were some of the finest Mauser's ever made and were sold all over the World, even after WWII, probably until the 1960s. The 8mm to me feels like a .308, not as much kick as a 30-06 shot from a 03A3. 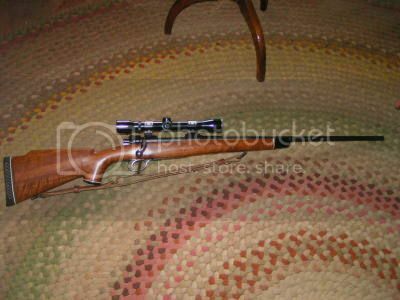 I have shot a 91/30 Nagant and its kick is not too much because of thsize of the Rifle, however I do not own one, but I do own a Chinese copy of the Russian M44, a Type 53 Carbine, it kicks like a Mule and throws a two foot flame, I hate that thing, it's far worse than shooting an Enfield #5 Jungle Carbine. Ah I didn't know that about BRNO. Haha that's funny about the carbine but kind of bad too. I think I like the looks of the full/fuller size better. 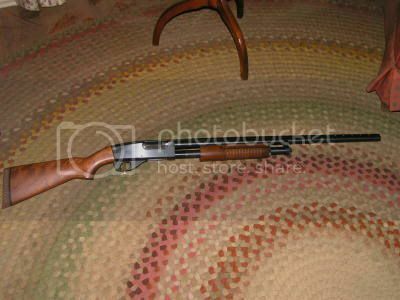 Name the Brand and Model of this 12 gauge Pump Shotgun. J C HIGGINS AND i DON'T KNOW THE MODEL. No, Hint a much more famous name.